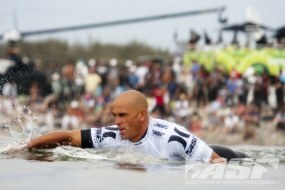 Kelly Slater paddles through the surf on the way to his narrow victory over Owen Wright (ASP). 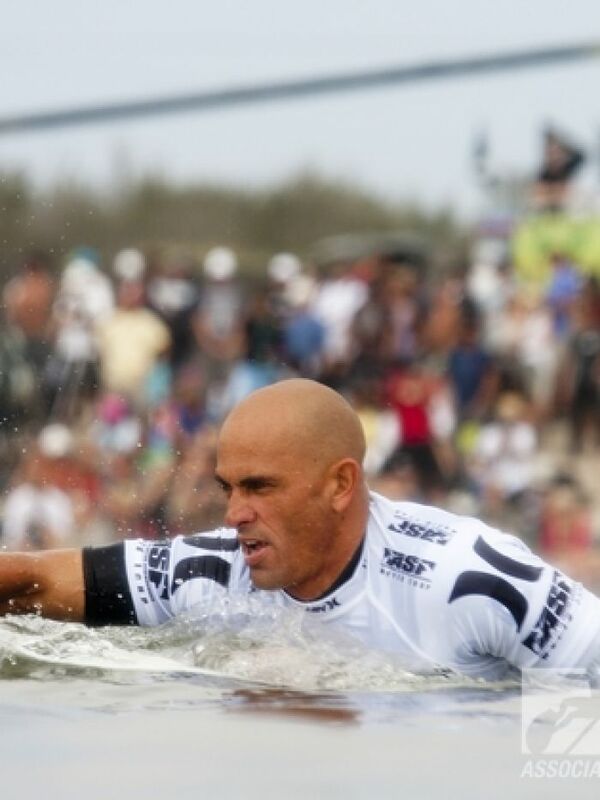 Kelly Slater sang Owen Wright’s praises after narrowly snatching the title from the rising Australian surfing star at Lower Trestles in California. It was the third consecutive meeting in a world tour event final for 10-times world champion Slater, 39, and tour rookie Wright, who is 18 years younger. And Slater avenged his defeat by Wright in New York in the tour’s richest-ever event earlier this month when he overtook the Australian in a last-minute exchange to win 17.50 to 16.74. The win bolstered Slater’s championship lead with 44,950 points after seven of the 11 events in his quest for an 11th world crown, but the 190-centimetre tall Wright remains in strong pursuit on 39,900 with countryman Joel Parkinson (35,400) third. “Owen (Wright) is tough and he’s been surfing great,” said a relieved Slater after claiming his fifth Lower Trestles title. “There really are no weak points to his surfing and he’s going to be a stand-out in every spot. “A lot of the guys tried to get him this week and I got lucky in that last exchange. After finishing seventh overall in his rookie season last year, Wright has continued to build momentum. He was runner-up to Slater at Teahupoo in Tahiti last month before toppling him to pocket the $US300,000 first prize in New York and he dispatched countrymen Mick Fanning and Julian Wilson on the final day to set up their third straight final clash. “I’ve been enjoying the rivalry,” Wright said. “We’ve had some great heats and the last three finals have been great. “I’m glad the sets came through at the end. It was a bit of a dud final but I’m glad that last exchange came though at the end. The next stop on the world tour is the Quiksilver Pro France from October 4-13.